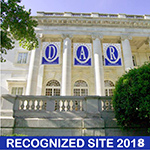 DAR is open to all women aged 18 or older who directly descend from a patriot of the American Revolution. For more information about requirements, please visit the NSDAR webpage at www.dar.org. We welcome new members and have several members who are willing to assist you with completing your application. If you have a relative who is a member of DAR, we might be able to use some of her information to complete your lineage. For more information about completing an application to join us, please contact us. Headquarters for our state DAR office. A patriotic lineage society for men. A patriotic lineage society for boys and girls aged 21 and under. Search DAR ancestors, descendants, Genealogical Research System databases, resources, and DAR Library catalog.